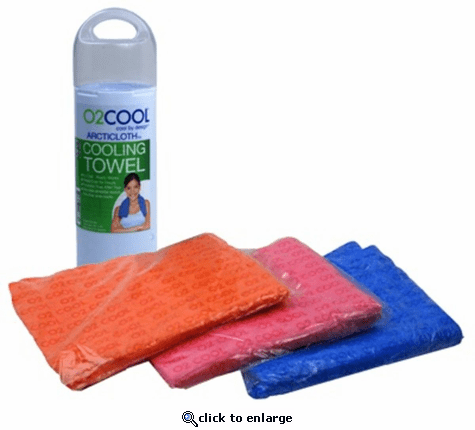 O2COOL's ArctiCloth towels are made of highly absorbent and evaporative material. Once wet, the towel produces a cooling affect with the help of simple evaporation. When wet and placed around your neck, the water begins to evaporate cooling your skin by as much as 20 degrees. ArctiCloth Cooling Towel is great to use on the job site, while working out, in the garden or at a sporting event. This is a very high quality cooling towel that helps you stay refreshed in the summer heat. Soft, absorbent and highly-evaporative material. Textured side cools, smooth side absorbs sweat. Large size - 33" x 13". Includes a plastic bottle that acts as a storage container for travel. Carry loop makes it easy to attache with a carabineer. Machine or hand was with liquid detergent. TO USE: Completely wet towel with cool water, gently wring out excess water, place textured side around your neck. The textured side cools and the smooth side absorbs. DURING USE: Ensure that the towel remains wet. When the towel stops cooling or begins to dry out, completely re-wet the towel with cool water. Do not use towel for more than 4 continuous hours and discontinue use if skin becomes irritated. TO STORE: Return damp towel to tube. The towel will dry out and become hard with no exposure to water. If the towel dries out while in the tube and becomes hard, pour warm water into the tube to wet towel and make it pliable prior to removing. If towel is affected by odor, mildew or mold, wash towel with warm water and soap and add ammonia to the detergent. For severe cases, bleach maybe used instead of ammonia, but the bleach may fade the color. BEFORE FIRST TIME USE: Hand wash towel with warm water and mild detergent for at least 30 seconds. DO NOT: Put your Cooling Towel in the dryer or freezer. How do cooling towels keep you cool? The towels are made of highly absorbent and evaporative material. Once wet, the towel produces a cooling affect with the help of simple evaporation. As long as the towel is wet, exposed to the air and allowed to breathe, the towel will evaporate and cool the user. Does a PVA towel cool better than a soft towel? No. The cooling received from both PVA and soft towels is similar, the difference is in how long they last. A PVA towel will typically hold more water and as such will last longer. A soft towel will need to be re-wet more often, but stays soft even when dry. How do I reactivate my towel when it stops cooling? Simply re-wet the towel with cool water to reactivate the evaporative cooling process. Can I put the PVA cooling towel in the freezer or refrigerator? The PVA towel can be placed in a refrigerator, but not in a freezer. Since the PVA towel material is loaded with water when in use, placing in the freezer will cause it to freeze and become brittle. Be sure to wash the towel before using and storing. We recommend putting the towel in a re-sealable storage bag in the refrigerator. What happens if my PVA towel dries out and becomes stiff? Simply re-wet the towel by soaking it in warm water. Once it becomes soft, wring out the excess water and re-wet with cool water prior to use. DO NOT try to separate or fold the towel when stiff as it may damage the towel. How long will the PVA towel last? With proper care and storage the towels will last and provide evaporating cooling for several years. Can the PVA towel be cut? Yes, the towel has an internal mesh reinforcing material that will allow you to cut it into any shape that fits your needs. Can I wear my PVA towel under clothes at night or when I am sleeping? No, we do not recommend it. In order to evaporate effectively, the towels should be allowed to breathe and be exposed to air when in use. In fact, turning the towel periodically when in extended use will help the evaporation and cooling process and allow skin to "breathe" as well. Is the PVA towel material recyclable? Yes, the organic nature of the material allows the towel to be ground up and blended with soil to help dry soil retain moisture. It\xCDs completely inert and will slowly decompose and become a part of the environment. My skin developed what looks to be a rash while using the PVA towel. What happened? : While the PVA material is medically safe and has been tested to be non-allergenic, prolonged uninterrupted use may cause redness or a mild rash to individuals with very sensitive skin. The towel material is so absorptive that if it begins to dry out and starve for moisture it can pull moisture and oil from your skin, resulting in redness or mild rash. The best solution is to make sure the towel has plenty of moisture in it and to take a break from using it every hour. If you experience a reaction, discontinue the use of the towel immediately.